Let’s imagine that you are part of the Music for Health team. All our ‘Local Directors’ spend their first month doing complimentary workshops at the venues we provide. (This way of marketing allows MFH workshops to sell themselves for years to come). Music for Health workshops have been tried and tested over 14 years with great success and are well respected. Assuming that you are a self motivated new ‘Local Director’ with passion and enthusiasm, we would make a conservative estimate that you could average 6X hourly workshops per week for the following 5 months. Part of MFH’s marketing strategy is to give a free initial workshop, so the homes can see for themselves the amazing effect Music for Health workshops have on their residents. Marketed in this way the MFH workshops sell themselves. To support this (beneficial to all) marketing method, MFH allows you 2 months to build your business before starting to pay the monthly royalty fees. The fully inclusive cost of a Music for Health medium sized area is £4580. You could therefore have cleared your initial expenditure in less than 5 months. If you choose to do more workshops a week, obviously, your initial outlay would be paid off much more quickly. You will have been provided with enough homes to do at least 10 workshops per week. One of our Local Directors does about 70 workshops per month, whereas others choose to do only a few. We want you working at a speed that suits you and your life requirements. The cost of a Music for Health area is between £3580 to £5875. The area size and cost depends on the requirements of the new incoming ‘Local Director’ and availability. Included in this cost at any level is a large box of quality instruments, a box of varied props that we use with the residents, a quality sound system, a box of stationery that is personalised for each Local Director’s area, full training and back up at all times, and of course the complete Music for Health library of C.D’s and colour coordinated workshop sheets. If you become a ‘Local Director’ the area you would be given would be exclusively your ‘Registered Area’, and a map of the area forms part of the formal contract. The area you will be given will have enough homes to support a reliable and ongoing income for the size of area chosen (a list of suitable homes is supplied as part of the start up package). Every detail has been taken care of to enable our new ‘Local Directors’ to have successful and rewarding workshops as part of the MFH team. Continual back up and support is guaranteed at all times. By the very nature of what we do at MFH, this is a very joyful and interesting time. Many of MFH’s new ‘Local Directors’ have a long distance to travel. To that end the training has been condensed into one intense day. Every aspect on every level of Music for Health being covered. A training DVD and Useful Information Folder are part of the startup kit, for easy future referral. After a satisfactory training day the complete startup kit including personalised stationery will be ready for you to take home. You will need to have the space in your car to carry all your kit. This will be in six boxes of varying sizes. The largest is 68cm x 44cm x 32cm. 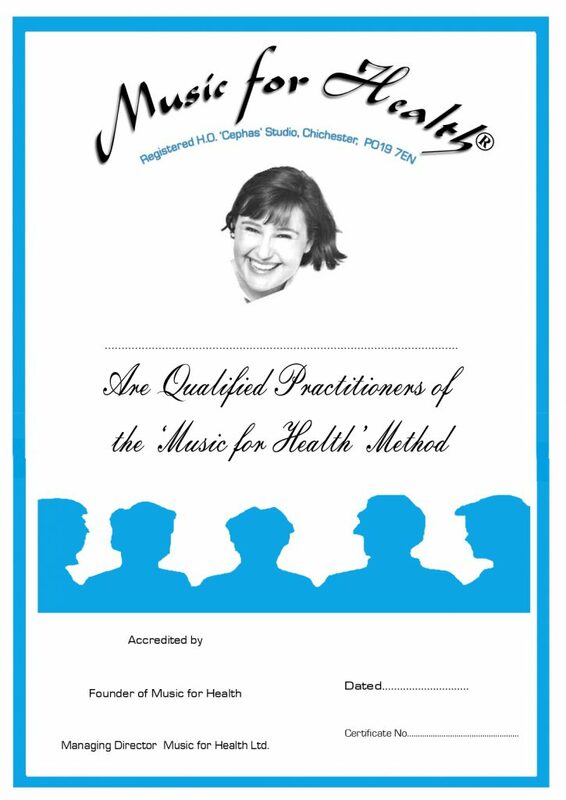 ‘Local Directors’ satisfying all the criteria, become ‘Qualified Practitioners of the Music for Health Method’. A certificate is given to make this official. Having been a valued team member, should you wish to retire or move area etc. MFH will assist you in selling on your area as a going concern to other caring people. Each Music for Health area not only provides a very rewarding business (in every sense of the word) but also an excellent investment for the future. After 13 years as hugely successful ‘Local Directors’ for the Worthing Area, Sally & Peter Sandon (Sally a former cabaret singer and Peter, a G.P. having taken early retirement before joining Music for Health) have now, sadly, totally retired. 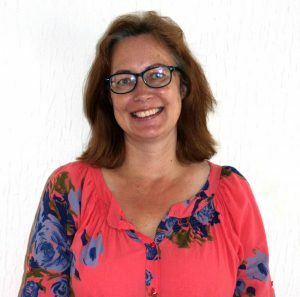 A lovely lady, Kirstie Davidson, bought the Worthing Area from Sally and Peter and has taken over the reins successfully as Music for Health moves forward into the future. 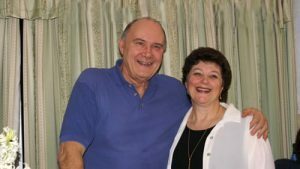 Peter and Sally still tell everyone that: “Music for Health is the most rewarding and fulfilling job ever”. Peter and Sally still support MFH in any way they can and will be joining the team in future celebrations.